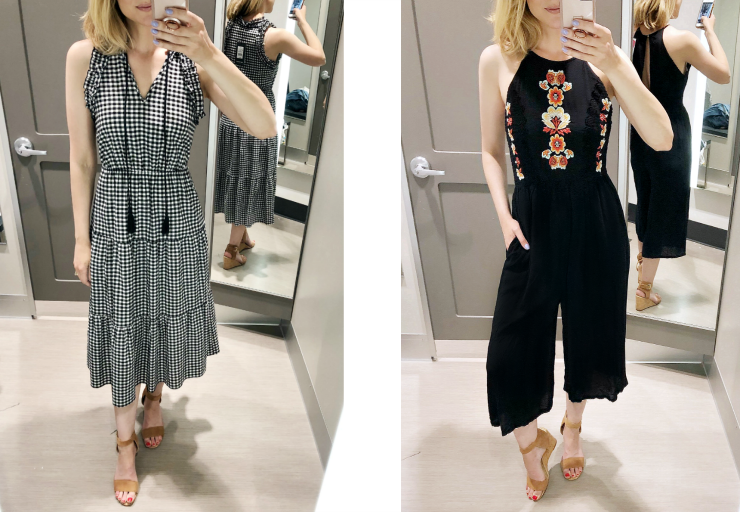 I’m excited to share with you my first fitting room try-on session today. 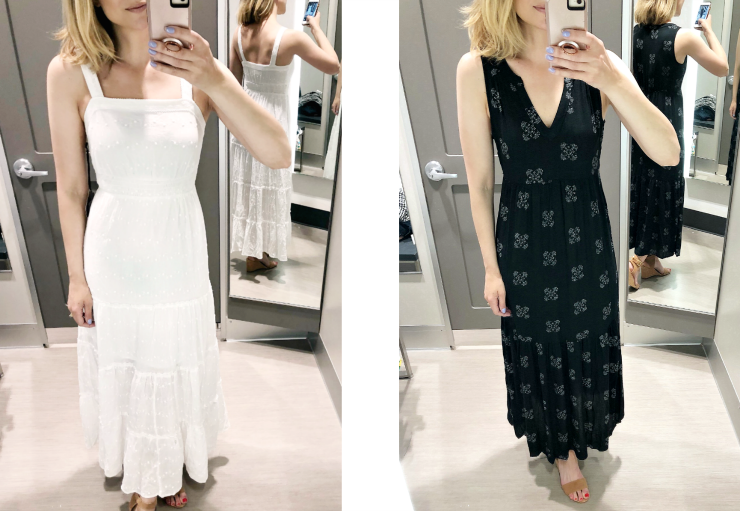 Many of you had requested that I begin posting these during my shopping freeze so you can check out the new arrivals at your favorite stores. 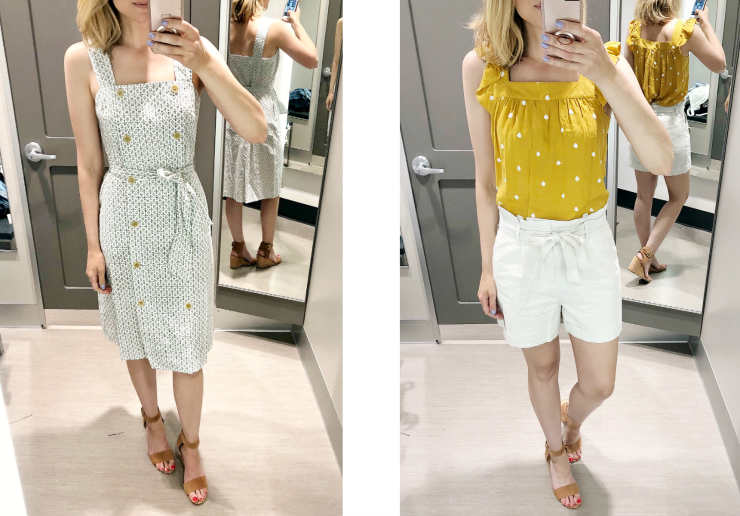 For my first edition, I chose to head to Target – but please comments below & let me know what stores you’d like to see in the future (and what types of items you’re looking for!). For reference, I’m 5’8″ and typically wear a 4/6 in most items. I didn’t think I was going to like this as much as I did. I was worried it would look a little too “country”, but I found the silhouette to be very flattering. It’s made from a lightweight fabric & also comes in solid black. Sizes are selling out quickly online, but you can also check your local store for availability. Runs true to size. I had to stand in an awkward way in this photo to show that this was a jumpsuit. I love the embroidery detail on the front of this & it’s super comfortable! It would be great if you have an upcoming vacation & it also comes in a pretty coral hue. The one strange thing is that the legs are only partially lined (to the knee). From looking at it, you can’t tell, but it feels a bit odd when you’re moving around. Runs true to size. This was by far my favorite dress that I tried on – if I weren’t on a shopping freeze right now, it definitely would have come home with me! If you’re engaged, this would be a gorgeous rehearsal dinner option or a great honeymoon dress. The fit is perfection – but if you’re on the shorter side, you’ll need to wear high heels so it isn’t too long on you. Runs true to size. This is a great lightweight day dress – it’s made from a gauzy fabric that breathes well and there is plenty of room for a bump if you’re expecting! If I were styling this, I would probably add a tan belt to help give it a bit more shape through the waist. It would also be great with a denim jacket on top. Runs true to size. 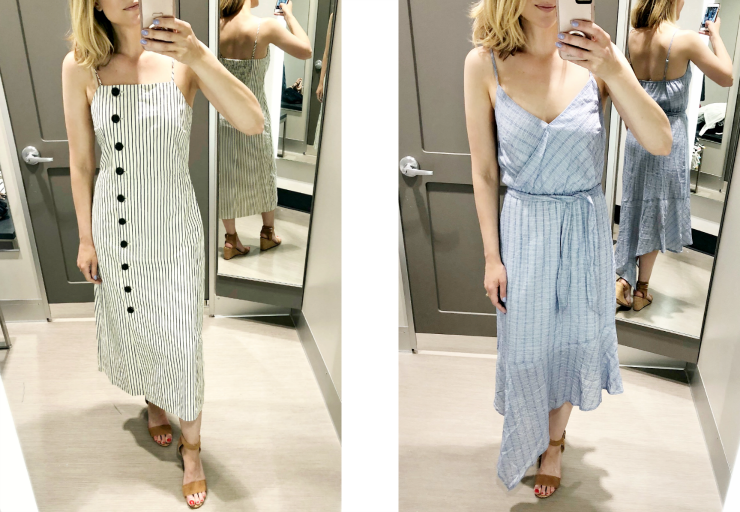 Another easy day dress – this was too short for me to feel comfortable sitting down & bending over in, so if you’re 5’8″ or taller, just be warned. I took my usual size & the fit was good, but it was a little snug through the chest (and I’m a 32B)…so if you’re larger chested, you may want to size up. This has a string tie for the waist, but it tied it in the back instead of the front. This ruffled top is one that I would definitely pick up – lightweight, flattering & easy to wear with skirts or shorts. I’m wearing the small here and the XS in the yellow below – both of them work well, it just depends if you want a looser, more relaxed fit. This striped skirt is so comfy – love that it’s a pull on style with an elastic waist & pockets! I think you could dress this up for work or wear on the weekend with a basic tank. Runs true to size. This was my second favorite dress, although I needed to go down a size (but they didn’t have it in store). I love the modern feel that the buttons give to this and that it has pockets. You can wear it partially unbuttoned too and you could also layer a tee underneath. I’d style this with mules & a printed neck scarf. Recommend sizing down. 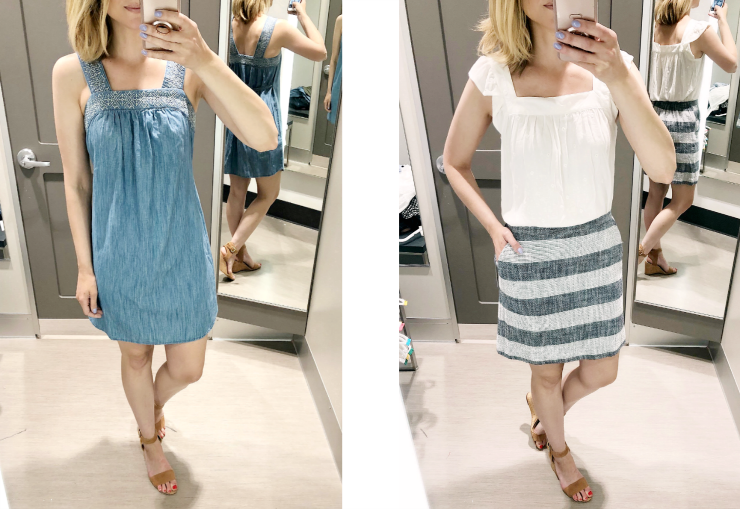 This is the same top as the ivory one above – I’d be tempted to get them both because the price is so great! I tried on lots of shorts in the store & these were the only pair that made the cut for me. The length is just right and the paperbag waist detail is perfectly on trend – great for dressing up or down. Runs true to size. I love the idea of this dress, but I wish it was a shorter. Because the fabric is a cotton poplin, I think it would be more flattering in a different length. The button detail is chic but the fabric felt a bit stiff. Runs true to size. This easy breezy dress would be great for barbeques and relaxed evenings out. I liked that the straps are adjustable and that the neckline is sewn together so you don’t have to worry about it being too revealing. The fabric tie is removable so you can swap out the belt & it’s lined. Runs true to size.